As the commercial and entertainment capital of India, Bombay is one of the densest amalgamations of sights, smells, sensations and sounds on the planet. 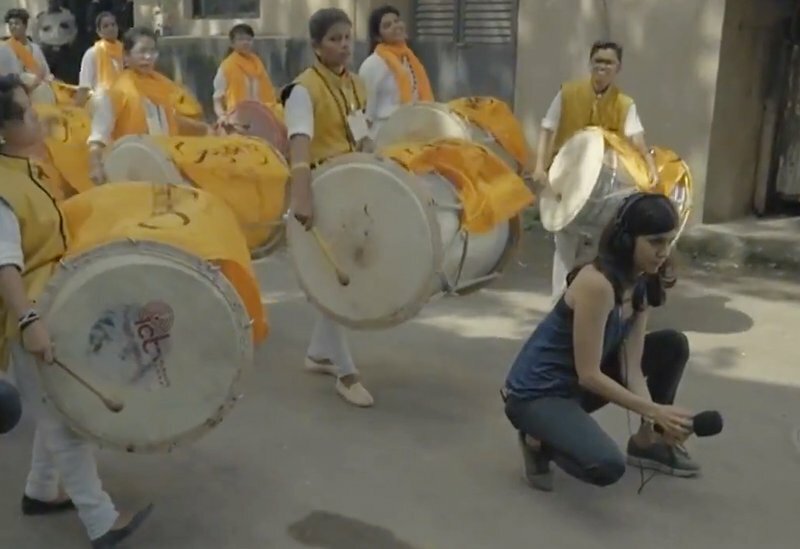 Who better then, than Bombay-based producer Sanaya Ardeshir, aka Sandunes, to take us around the city and explore its rich sonics in a new episode of Red Bull’s Searching for Sound documentary series. Join Sandunes as she visits some of Bombay’s places of work and worship – collecting recordings, drawing inspiration from the city’s vibrancy and working to incorporate found sounds into her own music. Check out the trailer for Searching for Sound below. Be sure to download the free sample pack and read our interview with Sandunes to learn more about the sounds, the place they come from and how she uses them in her own work. It sounds like quite a lot of work went into isolating the inherently musical moments in the recordings you made in Bombay. Were you yourself surprised by the variety of timbres, rhythms and melodies that your city offered up? Yep it was definitely a bit of work to go through tonnes of raw audio and pick and choose the best 'samples'. Mostly because Bombay is a fairly noisy city, so I had to decide where I wanted to gate or clean up sounds and where I wanted to leave in the atmospheric 'noise' that made that sound so special. I have done a few projects with found sound before, but mostly interviews or spoken word that sits over a bed of music and was designed to be a narrative. I've never really made a piece of music entirely from found sound, so this was definitely a new process. I expected to gather a lot of different textural and rhythmic information but I didn't quite expect it to all be so usable or musical! The process of actually looking for sound in a relatively 'normal' environment has definitely changed the way I hear things in my city. I feel like my listening has gotten re-activated in a way that I didn't foresee. The sample pack you’ve created features lots of really interesting percussive hits gathered at wood and metal mills, flower and vegetable markets and elsewhere in Bombay. Which of the sounds did you end up using in the track you made and what was that process like? I then grouped sounds from different spaces and with different timbral qualities and compiled them into several Drum Racks. My method was to build about 10 different Drum Racks, and then to play out grooves on a Roland SPD-SX percussion pad. I collaborated with Aarifah Rebello, a drummer who has a really melodic approach, and she played out a bunch of different grooves on all of the kits and then I sort of picked/chopped and chose what worked for the music. I tried to go easy on the processing of each sound so as not to take away from the atmosphere or the quality that came with each sound. I wound up using EQ Eight on most of the samples to roll off the low end, and I gated a few. I usually automate the frequency cutoff on Live's Auto Filter to bring elements in and out, and for recurring hits, I often used the Max for Live LFO to modulate the gain so that the rhythms breathed a bit. My most favourite finds were the hits from the potato chopping at the Byculla veggie market, the crates being unloaded from trucks and tossed on the ground from the Dadar flower market, a lot of the bell/clings from the metal mill too, and most of the 'groove' is from the hammering and breaking up of all the (stolen?) car parts at Chor Bazaar. Is it important to you that your geographic or cultural locality is represented in your music? Is it necessary for the listener to know that some of the sounds in your track came from a specific place – from this one particular market in Bombay, for instance? And to put it somewhat too dogmatically, isn't there some essential contradiction in incorporating sounds and structures which are so specific and localizable within something abstract like electronic music? In other words, isn't the whole idea of electronic music to make something in a new way – free of any connection to an identifiable time or place? That's a really interesting question and it's so relevant to the times that we currently live in, given the freedoms and accessibility associated with the world and scope of music making today. In my belief, there isn't any right or wrong way to engage with music or music making, and if recontextualizing hyper-localized sound results in an interesting output, then I don't see how it detracts from the larger theme or freedom of electronic music. It's not important to me for the listeners to be able to identify a geography when they listen to the piece, rather I would hope that the music invokes an emotional state which is linked to the essence of all the sounds and spaces involved. Sometimes the idea is to mutilate the found sound into unrecognisable bits of audio, which don't reveal any of the essence of where they were captured. But here – and I was definitely operating from a different place – my intention was to create a bit of a collage and retain essence, without being unbearably literal in the process. What do you envision other producers do with the sounds you have made available? I'm honestly just excited to see how different people interact with the sounds and what they do with them. I'm sure there's enough variety in there for really diverse uses, so I don't know what to expect, but I'm keen to listen! Be sure to also check out Searching for Sound: Mitya explores Tatarstan. Keep up with Sandunes on Facebook and Soundcloud.